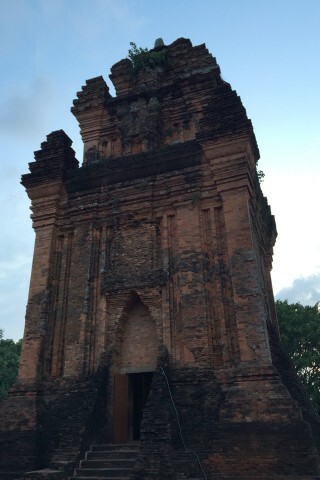 Photo: A 14th century-built Cham tower. Thap Nhan is a Cham tower located in the southwest corner of the city, close to the bridge across the Da Rang river. Browse places to stay in Tuy Hoa on Agoda.com. Free cancellation. The tower is on top of a hill called Nui Nhan (Swallow Mountain). Yes, it is yet another Cham tower—travel central coast Vietnam and you’ll likely to have encountered more than a few and there are some impressive ones in Qui Nhon, the next major city to the north. Still, it’s something to do if travellers find themselves staying in Tuy Hoa for a night or are passing through and needing a break. This one was built in the 14th century by the Chien Thanh people and is 20 metres high. It’s a healthy jaunt if done by foot, and popular with locals who come to hang out and stroll around at sunset before it’s beautifully lit up at night. Normally we’d give street directions to a spot like this, except the critical streets are poorly marked and given that it’s impossible to miss, it’s easier just to head straight towards it at the corner of Tran Hung Dao and Nguyen Tat Thanh Street. The access road is on a sidestreet completely un-marked yet easy enough to find. Where the uphill road takes it’s first right turn, there’s a stairway leading up to the tower or continue along the paved road. Walk, do it with your own transport or take a taxi. See below for more sights and activities in Tuy Hoa that are listed on Travelfish.org.